It doesn’t matter if it’s your first day skiing at Whistler Blackcomb this season or your first time ever visiting the town. We’ve compiled a list of essential information to help you create the best memories from your day on the mountain. There is something for everyone here. This piece of advice is a timeless classic designed to keep you as far as possible from the circus of early morning lines. Collect your rentals, print your lesson vouchers and sort lift tickets the night before. It’s a poorly kept secret that lifts often upload before the advertised time of 8:30am so by arriving thirty minutes earlier you could add half an hour of fresh snow and empty runs to your day on the mountain. A great idea for those not born with the early bird spirit is TELUS Fresh Tracks. With Fresh Tracks you can upload the Whistler Village Gondola at 7:15am where an all you can eat buffet breakfast awaits at the Roundhouse Lodge featuring eggs, bacon, pastries, yogurt, fruit and unlimited coffee. Is that enough to tempt you out of bed in the morning? Finally the busy lunch period for food is 12 – 1:30pm so taking an early or late lunch will give you the finest choice of tables with a view. You will notice less people on the slopes during peak eating times too. When it comes to dining Whistler Blackcomb really does offer an elevated experience. 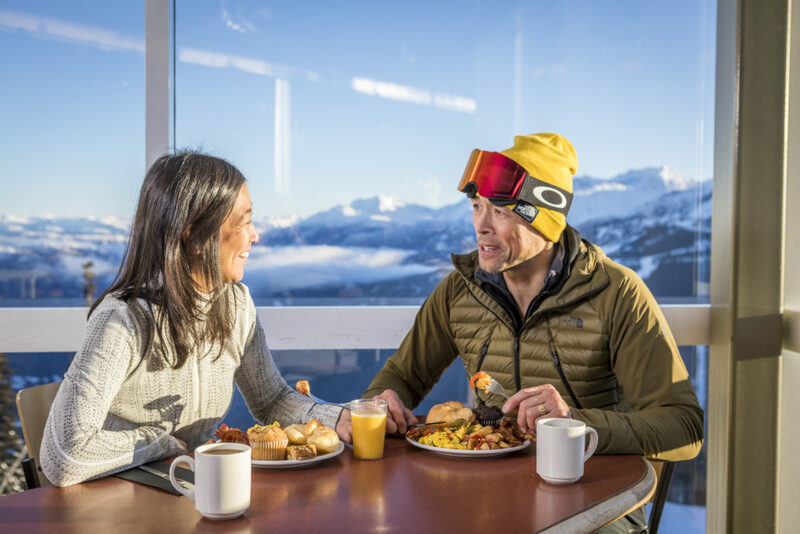 Christine’s on Blackcomb is a fine dining experience with panoramic views from cleverly designed tier seating. The mountain comfort dishes are made with fresh local ingredients and accompanied by a diverse wine list. On Whistler you will find full-service dining at the Roundhouse Lodge. Steeps is a proud supporter of locally grown fine foods and wine. The restaurant is host once a month for the Winemakers Dinner featuring the best local vineyards paired with a full course luncheon. The alpine huts are on the other end of the spectrum but equally as satisfying. Ollie’s Grilled Cheese is located at Olympic Station just a short upload from the village. Do not mistake the gourmet sandwich for a light snack. For plant-based foodies The Raven’s Nest at the top of Creekside Gondola has a vegetarian menu that is enjoyed by everyone. There is far more to the menu than a classic green salad and the café has optional meat extras too. At the largest ski field in North America it can be difficult deciding where to ride first and how to see everything. Free orientation tours from CIBC Mountain Hosts are a great idea for new visitors wanting to learn their way and for seasoned regulars hoping to learn more about the area too. 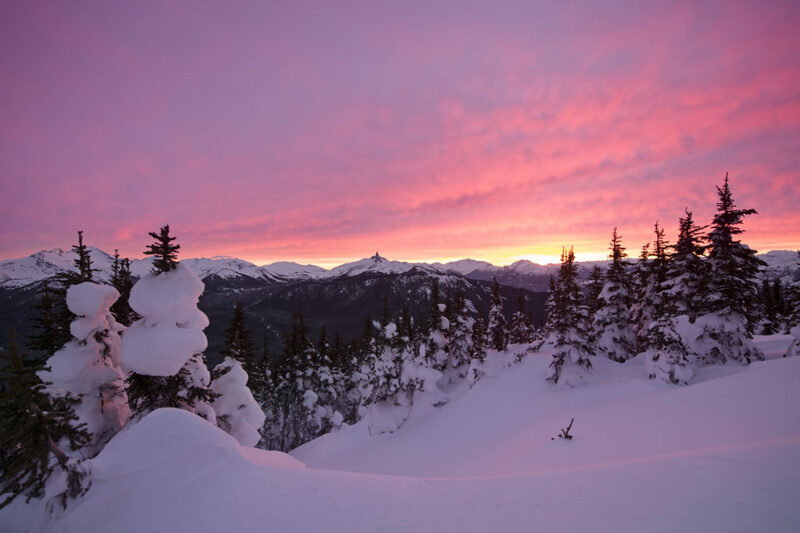 The tours include both Whistler and Blackcomb mountains plus a trip on the Peak 2 Peak Gondola. The meeting time is 11:15am at the Roundhouse Lodge and the tour is included with the price of a pass or day ticket. On Blackcomb the GMC Race Centre is friendly competition not to be missed. The Dual Slalom is free to use and the timed course is set on an intermediate slope to accommodate all abilities. You can compete against your friends, family and pretty much anyone on the mountain that day. Be warned though the Whistler Blackcomb slopes are home to a lot of professionals. Lessons in general are a great way to discover new runs and develop your skills. For something truly unique Ski or ride with an Olympian is the most exclusive program in the Whistler Blackcomb snow school and a dream come true for many. The Olympians offer help with technique while sharing their stories of competing. The Whistler Blackcomb snow school instructors are ready to go just like the Olympians (although not as fast). 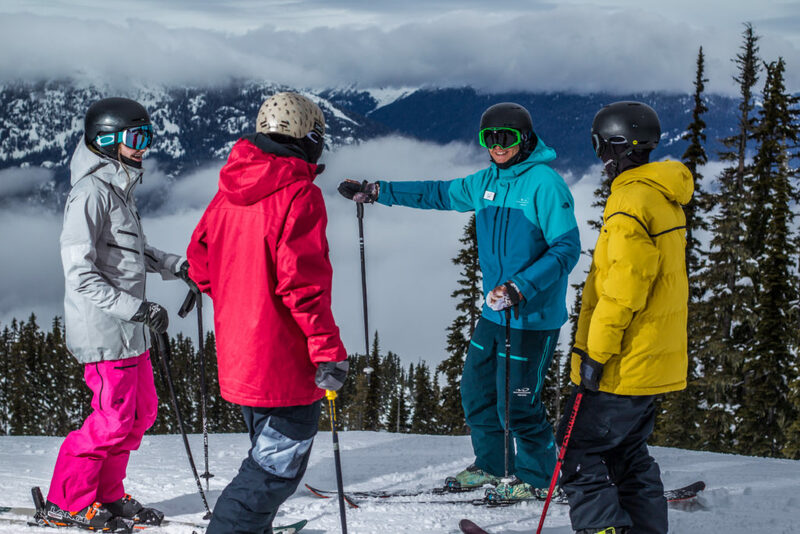 For more information on lessons with Olympians and non-Olympians check out the Snow School section on the Whistler Blackcomb website. 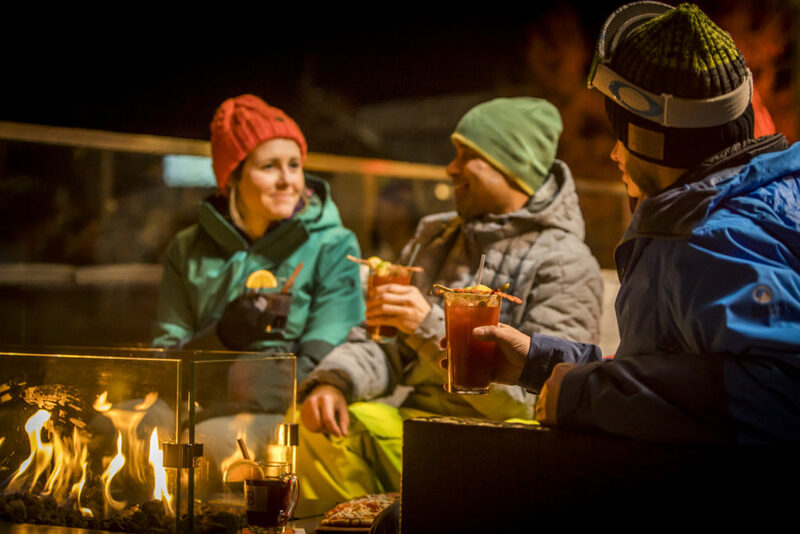 The Après in Whistler is as renowned as the skiing itself and the good news is that you don’t have far to go from the bottom of the slope to the nearest patio. Garibaldi Lift Co sits above the Village Gondola building overlooking the slopes. In recent years the venue has won several awards in the local area for its après, patio and as a place to watch live music. In the Upper Village you will find Merlin’s Bar & Grill. Depending on the hour of your visit Merlin’s is a mix of a restaurant, lounge and club combined. The mountain cabin theme inside has old school décor plastered across the walls creating a famous party atmosphere where partying on the table is encouraged. You can keep up with which DJs will be playing here by following the Facebook page. A vacation in Whistler would not be complete without a trip to Creekside where skiing in Whistler began. Dusty’s is the favorite après spot for many locals for different reasons. Some say the patio is the sunniest in Whistler, others crave for the legendary BBQ dinner. The great thing about Dusty’s is it’s possible to have both. EpicMix is the latest app for skiing or boarding at Whistler Blackcomb. The app contains essential data which is useful for bragging rights such as your total days on the mountain and how much vertical feet you have covered. More essentially the app displays current lift times and knows when lifts are on hold or closed. You can also view updated grooming reports and mountain cameras to help find the best snow. With TELUS free Wi-Fi available in select locations on the mountain it’s easier than ever to stay up-to-date with the alpine conditions. The mountains open November 22nd thanks to the abundance of early season snowfall and the Opening Day celebration is an event marked on many calendars. From then until Christmas you can expect small lines with plenty of space on the runs. The terrain park will slowly expand over the first few weeks so it’s a great chance to check out what’s being created before anyone else has a chance to scope it out. Whistler is bursting with life from Christmas through to January. This is a very special time to visit because the buzz is high in town and events are plentiful. If you plan to visit during this period be sure to book in advance to avoid disappointment and higher rates. It’s no secret that this is a popular time of year with most of the mountain terrain and features open by this point. February to March is the middle of the season and this season brings gloriously longer days. You can expect ‘powderhounds’ to arrive on the mountains with high expectations for perfect skiing conditions. Plan your vacation for this time of year to discover why locals know March as ‘powder month’. A further hint is you’d be well advised to buy or rent powder skis. If you love winter sports but want warmer and sunnier days then spring skiing in March and April have your name carved into them. You will benefit from surprise powder mornings plus shorter lines and longer, warmer days. The alpine terrain does begin to close but with the World Ski & Snowboard Festival hosted during this time there is still plenty of terrain available. Spring skiing is a whole new experience that is popular for a very good reason. Trade some of your winter gear for sunscreen when packing your for this vacation for sure. Find out more about events on the mountain and reserve your lift tickets by visiting the Whistler Blackcomb website.